A stunning character 6 bedroom, country house originally constructed in 1910 with some later additions and major renovation in recent years. 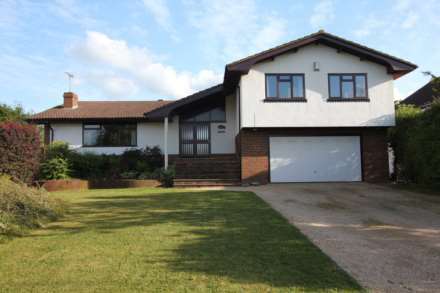 This property certainly has the ‘wow` factor and is set in a prime location and highly sought after road. Architect designed, lavishly refitted and redesigned to exacting standards. Situated adjacent to and overlooking open natural countryside and set in what is considered to be one of the most important and valuable semi-rural residential lanes in Pangbourne. Occupying a wonderful position within old established gardens that have been recently re-landscaped. Franklands is entered by way of a private lane with video intercom electric gates complete with pedestrian side entrance. This is a peaceful, private, very exclusive location with seclusion and a high level of security. ● The fabulous living/kitchen area is spacious with limestone flooring and polished stone working surfaces, a central island with walnut breakfast bar and beautifully designed Italian drawers and cupboard units. Fitted and concealed twin fridge freezers, Miele ovens, microwaves and a wine cooler. Twin stainless steel sinks with waste disposal unit. Summary of accommodation: Drawing room, family room, cinema room, large kitchen/living room, conservatory, large reception hall, utility room, 2 cloakrooms. First floor: 5 bedrooms, 3 bathrooms, dressing room to master bedroom, dressing room/study to bedroom 2, galleried landing, utility room. Garage/Annexe/Office: Garage block for 2 cars; twin doors to central storage area, large games room to rear, first floor bedroom and ensuite bathroom, roof terrace with a central weight bearing glazed floor. There are also plenty of facilities for the golfing enthusiast in the area; Streatley Hills, Mapledurham and Calcot to name but a few. Services: Mains electricity, gas and water. Gas fired central heating. Septic tank, drained 1 to 2 times a year.